The following article was printed in the Glasgow Herald of Monday, 9th April 1956. 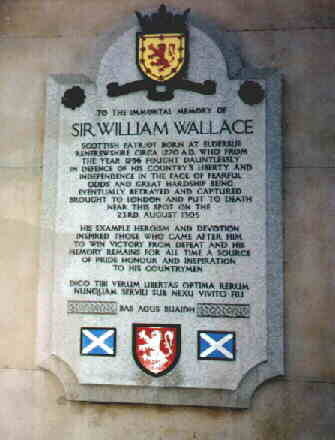 About 100 Scots gathered at the unveiling of a memorial to Sir William Wallace erected on the wall of St Bartholomew s Hospital close to the site of his execution. After the ceremony those present sang the National Anthem. Suddenly a man jumped onto the platform, grabbed the microphone, and shouted Refuse to sing this song! The platform party included the Earl of Dundee the hereditary Standard Bearer for Scotland and his Countess. The MP for Kelvin Grove, Mr Walter Elliot, had just given an address. Mr Elliot seized the man who was then escorted from the platform by two policemen as he continued to shout. He was taken to Snow Hill Police Station where he was charged with insulting behaviour . The man was later released on a bale of 2 pending trial. His name was given as Padruig MacGillefhinnein age 33, chairman of the London Branch of the Scottish National Party. An unofficial part of the ceremony involved the laying of a wreath by the London Branch of the S.N.P. A spokesman for the Party said that the man s actions were in no way sanctioned by the branch although they did believe that Scots Wha Hae and not the National Anthem should have been sung at the official ceremony. Scots Wha Hae had in fact been sung earlier by the crowd of Scottish spectators. The Saltire and Lion Rampant were placed over the Memorial Plaque but when the time came for the unveiling by the Countess of Dundee the flags refused to part when the ropes were pulled. She tugged again at the ropes but the covering would still not fall away. The Rev. Robert V.F. Scott Minister of St Columba s Church of Scotland, Pont Road, and Chairman of the Memorial Committee, stepped forward to help by pulling on the ropes several times. Still nothing happened. Pipe Major Willie Ross played The Flowers of the Forest as the struggle with the ropes continued. Finally the flags covering the Memorial had to be simply pulled aside by hand. Reveille was then sounded by two buglers of the Scots Guards. a source of pride, honour, and inspiration to his countrymen. London Scots raised £1000 to pay for the Memorial and its maintenance. Contributions were also received from Englishmen.